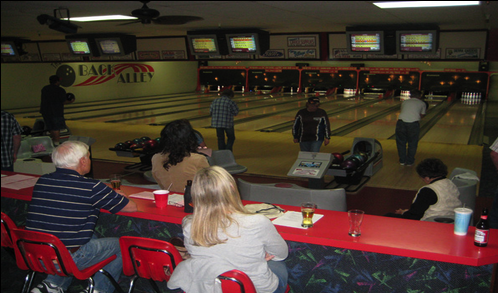 An image from Back Alley Bowling’s website. SACRAMENTO — Members of the Florin Chapter of the Japanese American Citizens League and the Council on American Islamic Relations-Sacramento Valley are alleging that Back Alley Bowling, Bar and Grill in Bishop, Inyo County, denied them service on April 25, the day the two groups attended the Manzanar Pilgrimage. After sending a detailed complaint to the bowling alley, the Florin Manzanar Pilgrimage Committee, a joint project of Florin JACL and CAIR-Sacramento Valley, proposed meeting with the management at a location midway between Sacramento and Bishop, which are 300 miles apart, in either Gardnerville or Minden in Nevada. “The Florin Manzanar Pilgrimage Committee, sponsored the Asian American and Muslim American young adult group, was denied service by Back Alley Bowling, Bar and Grill employees in Bishop on the night of Saturday, April 25, 2015. This discrimination in public accommodations deeply offended us and denied our civil rights. “The Florin Manzanar Pilgrimage is a ten-year project of the Florin Japanese American Citizens League (Florin JACL) and the Council on American Islamic Relations-Sacramento Valley (CAIR-SV). Since our group has faced similar racism and bigotry at Back Alley Bowl in the past, this is particularly egregious. Fundamental changes need to be made. “This mistreatment is an insult to the 1,500 people, especially those senior travelers in our group imprisoned during World War II, who come annually to the area to visit Manzanar National Historic Site. They come to learn about America’s World War II concentration camps, the lessons for today, and to stand up against such ignorance and discrimination targeting innocent people. “Our investigation of the circumstances that day shows the following. Our group of 15 Asian American and Muslim American young adults, plus some older members and senior citizens, was denied service at Back Alley Bowl on three occasions on the night of April 25, 2015. They conducted themselves in a civil, reasonable manner at all times, offering workable options to bowl, despite alleged computer problems and shutting down the business early though posted hours were until midnight. “About 9:45 p.m., the night of Saturday, April 25, a group of 8-10 Asian and Muslim Americans went to Back Alley Bowl to bowl. The ‘Open’ sign outside was lit and the establishment was operating. Three bowling alley lanes were open and lit with two of them occupied by a white family group. Some patrons were drinking at the bar and eating inside the restaurant. “When our group asked the young clerk if they could bowl, he was flippant and rude. He claimed that the computer system was down and they couldn’t bowl. Though doubting a computer system could be down when people were still bowling, our group tried to find reasonable solutions. They asked that the computer be rebooted, offered to wait for a repair person to come, to use the vacant lane, wait for the family to finish, pay cash if the cash register was down, hang out buying food and beverages, or even just watch the family bowl. “They were met with flimsy excuses, lies, a statement that the family had been bowling with the system down for the past three hours, and the clerk saying they were shutting down. “Our group left Back Alley Bowl, dissatisfied at this poor treatment, discussing how to get fairness, and talking to others in our group who were also upset at this discrimination. Some who had remained outside said another employee had walked to the lit ‘Open’ sign and turned it off while the group was inside. “When a couple of other members of our group heard about this, they went into Back Alley Bowl and tried to go bowling. They too were refused. “As our group stood outside the bowling alley around 10:30 p.m., talking about this, they saw several employees come outside, including one taking out the trash. They politely asked to speak to the original male employee they had talked with previously. “He came outside inappropriately carrying a three-foot-long stick and continuously raised the stick above his shoulders while speaking to our group. He stated that the system had been frozen for the past three hours and that the ‘Yoda’ computer technician lived 10-15 minutes away and it would be too late to have it fixed. “Our group found that incredible since that meant the other party there had been bowling for over three hours. The male employee eventually let our group know that his manager was inside and they requested to speak with her. “In contacting residents of Bishop and others sharing information over Yelp reviews, we learned of more instances of Back Alley Bowl discrimination, including people met with racist stares with which people of color are all too familiar. As mentioned before, our Florin Manzanar Pilgrimage Committee had experienced this type of bigotry before at the bowling alley. “We do not see this as a matter of a computer being down, misunderstanding, perception, or employee confusion, though these may have played a part. It’s a matter of denying services in public facilities to people of color and religious minorities. “We are aware of the concerns of others in Bishop about this mistreatment. We have met many good people there who have welcomed our diverse group into their businesses. This concern is a hopeful sign that fundamental changes might still be made at Back Alley Bowl and that this black mark be removed from the city of Bishop. Among the 36 people signing the letter were: Andy Noguchi, chairperson, Twila Tomita, co-chair, and Brandon Miyasaki, youth coordinator, Florin Manzanar Pilgrimage Committee; Marielle Tsukamoto, co-president, Florin JACL; Maheen Ahmed, programs manager, and Danna Elneil, operations manager, CAIR-SV; Lucy Porras, programs manager, CAIR-San Francisco Bay Area; Brice Hamack, Esq., Northern California civil rights coordinator, CAIR-California; Brenda Fong, Chinese American Council of Sacramento. Copies were sent to the mayor, Chamber of Commerce, Paiute Tribe and Rotary Club in Bishop; The Inyo Register; the superintendent of Manzanar National Historic Site; the Manzanar Committee; and the national offices of CAIR and JACL. The bowling alley has not responded to media requests for comment. “Please be advised that this office represents Back Alley Bowling regarding the incident which has been the subject of several communications. “The purpose of this letter is to advise you that the business and each of the individuals connected with the business has legal representation and to request that you direct any further communication to them through this office. “Be assured that your concerns have been received with the utmost respect and consideration. On behalf of my clients, I am requesting that this matter be resolved at this point upon the record as it now stands. You have stated your displeasure and concerns; my clients have explained themselves and apologized for any misunderstanding. Be assured that these expressions are sincere. “I have advised my clients not to proceed with a meeting in Minden with you at this time. Frankly, I do not perceive the utility in continuing to rehash a subject that has been fully vetted. My clients are innocent of any wrongdoing in this matter and need to be left alone so they can concentrate on making a living and serving those who appreciate their great work.